I was recommended to take probiotics as a supplement to my diet. And those pills ain’t cheap! So a cheaper excuse was to make kimchi! I was happy that there were new Napa cabbages that just arrived from Australia in the market so I greedily bought 3 big heads of them. It was my first attempt but I studied Maangchi’s recipes forward and backward to make sure I understand the steps and techniques. After all we are playing with bacteria here and I wouldn’t want to get some kind of food poisoning from this. We had to go out in the day so I decided to start at around 7pm. Little did I know it will turn out to be a 3.5 hours job. Lesson learnt: Start small when trying new recipes next time! Anyway, it’s finally done! 3.5kg of Napa cabbage all marinated with homemade kimchi paste and ready to be fermented. Can’t wait to eat them! 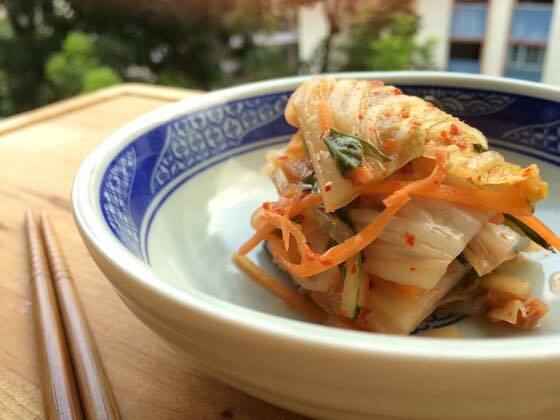 Check the kimchi recipe out here!